BINTANGOR: Months after it was first sighted and chased away into the jungle, the ‘strange creature’ at the centre of the video clip that went viral earlier this year was finally found and captured by oil palm plantation workers today. The sun bear captured by the workers this morning. 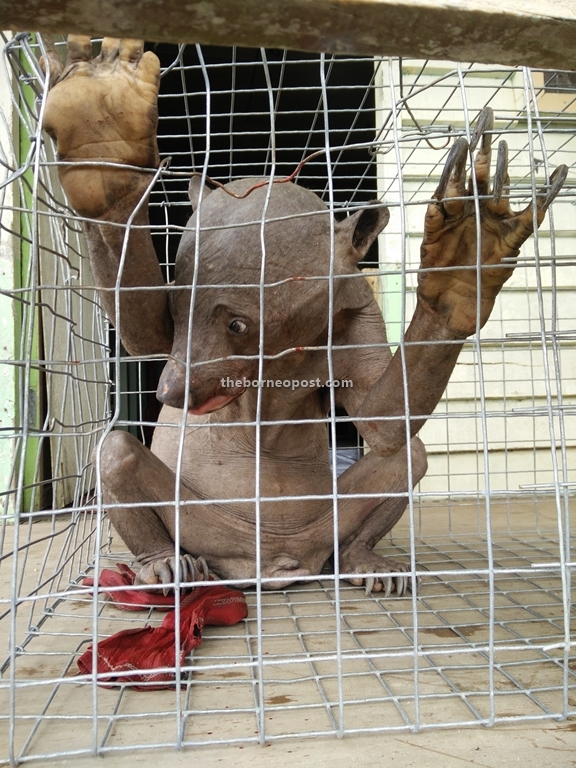 According to the plantation manager who requested anonymity, the animal which is suspected to be a sick and hairless sun bear, was discovered by the workers at about 7am within the same area where it was first spotted on Jan 30 this year. “The workers were on their way to work when they saw the animal and caught it after that. They brought the animal to the plantation office before we informed Sarawak Forestry Corporation (SFC),” he said when met yesterday. Sibu SFC representative Nickson Robi who came to collect the animal today said it would be taken to Matang Wildlife Centre in Kuching where they will also confirm what species of bear it is. “We will try to find out why it is sick and hairless,” he said, adding that SFC appreciated the help of the plantation workers. After the initial reports of the animal sighting in January, SFC had launched a Search and Rescue (SAR) operation to find the bear. Nickson advised public members that had any information or had witnessed any illegal activities involving wildlife to report them to SFC immediately. The State Wildlife Protection Ordinance provides maximum fine of RM10,000 and/or a year in jail if an offender is found hunting, killing, harbouring, selling or eating protected animals without permit, he said. The animal was first sighted by four Indonesian workers who were about to finish work at about 1pm on Jan 30 in the plantation. One of the workers, Herman Tutu said they were shocked by the appearance of the hairless creature. He said he quickly grabbed a tree branch for protection when the animal charged at them at one point. “Initially, we thought it was a dog or monkey. When we got nearer to check, we were shocked because none of us had ever seen such a creature. “I poked it using the branch to force it back into the forest when it charged at us. The animal then bit the branch and we could only watch as it ripped the tree branch away,” Herman recalled.